Local officials encourage the use of carbon monoxide detectors in Newburgh while raising awareness about the imminent dangers of CO poisoning on Saturday, March 28, 2015 in Newburgh, NY. 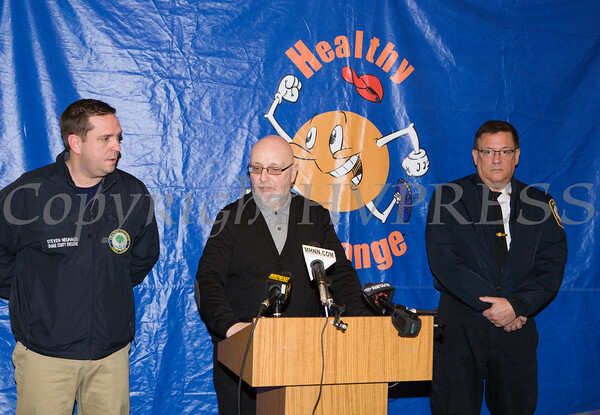 Orange County Executive Steve Neuhaus, (left) looks on as Robert Deitrich, Director, Community Health Outreach, addresses those gathered, including Newburgh Fire Chief Michael Vatter, to encourage the use of carbon monoxide detectors in Newburgh while raising awareness about the imminent dangers of CO poisoning on Saturday, March 28, 2015 in Newburgh, NY. Hudson Valley Press/CHUCK STEWART, JR.